Pyongyang, September 5 (KCNA) -- Kim Jong Un, chairman of the Workers' Party of Korea (WPK), chairman of the DPRK State Affairs Commission and supreme commander of the Korean People's Army, Tuesday visited the bier of Academician, Prof. and Dr. Ju Kyu Chang, alternate member of the C.C., WPK, deputy to the DPRK Supreme People's Assembly and adviser to the C.C., WPK, to express deep condolences over his death. He was accompanied by Thae Jong Su, Kim Phyong Hae, Ri Pyong Chol, Hong Sung Mu, Hong Yong Chil and Kang Pong Hun. A wreath from Supreme Leader Kim Jong Un was seen standing before the bier. 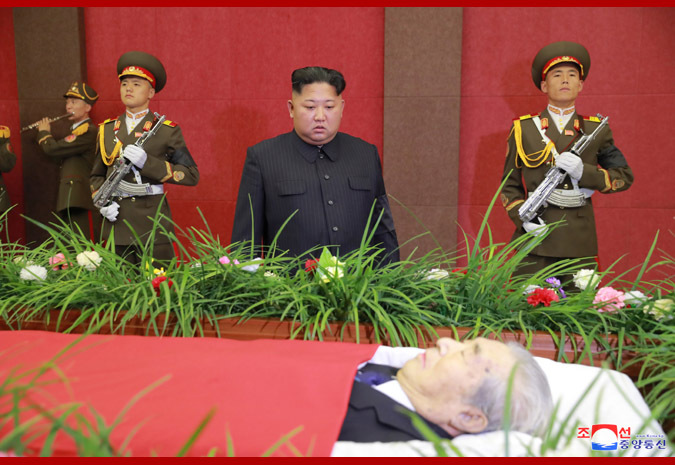 Kim Jong Un paid silent tribute to Ju Kyu Chang, with a bitter sorrow of losing precious revolutionary comrade.